Israeli soldiers abducted, on Friday at dawn, six Palestinians, including a child in addition to the father and the wife of a political prisoner, in several parts of the occupied West Bank. In occupied Jerusalem, the soldiers searched a few homes, interrogated Palestinians, and abducted Mohammad Shalabi. Many army jeeps also invaded the al-Khader town, south of Bethlehem, and abducted the wife, and the father of a political prisoner, identified as Abdul-Mon’em Salah. Ahmad Salah, the coordinator of the Popular Committee against the Annexation Wall and Colonies in al-Khader, said the soldiers abducted Abdul-Mon’em’s wife, Niven Salah, in her thirties, and his father Mohammad Omran Salah, 67, after invading and violently searching their homes. It is worth mentioning that Abdul-Mon’em was abducted by the soldiers more than two years ago and is still held without charges. Furthermore, the soldiers invaded Deir Istiya town, east of Salfit, searched homes and abducted a young man, identified as Sharaf Daoud ‘Obeid. In Qalqilia city, in northern West Bank, the soldiers searched homes and abducted a child, identified as Mohammad Ma’zouz Daoud, 13. 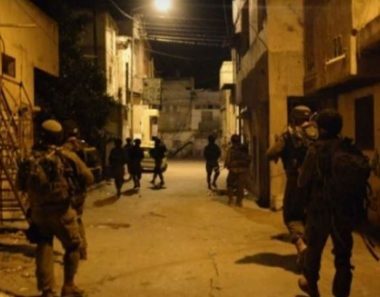 In addition, the soldiers invaded Beit Ummar town, north of the southern West Bank city of Hebron, especially the al-Ein al-Jalda areas, searched and ransacked many homes, and abducted Issa Hashem Bahar, 20. The soldiers also invaded many neighborhoods in Hebron city, and searched a home, owned by Amer Ribhi al-‘Oweiwi, in the Salaam Street.